How Long Does Trash Last? This page provides you with a snapshot of this activity that looks at the history of our 5 most common waste materials. We use paper, plastic, glass, metal and organic matter in our everyday lives. But do we actually know where they come from and when they started to be used? In this activity, we will explore the history and some interesting facts related to these raw materials. Use your creativity to make a huge timeline and help other students learn more about these materials and their important role in our lives. We recommend that you use the ‘Introduction to Solid Waste’ activity before any of the other activities as it is a good starting point for students to learn about waste and provides a comprehensive overview of how waste is generated and its impacts on animals, the environment and us. If you have already done so and wish to continue to download the rest of this free activity please click on the download icon below. Enjoy! paper by cutting each piece into four. Choose the length of the timeline according to the space and the location where it will be displayed. Mark time intervals along the paper/string timeline. Check the fact sheets in order to arrange the facts from the oldest date to the most recent. Note: the timeline spans a large timescale from billions of years ago to the present day; therefore, it does not have to be to scale, but it should give some indication of time and direction. See an example diagram below of how to mark time intervals. 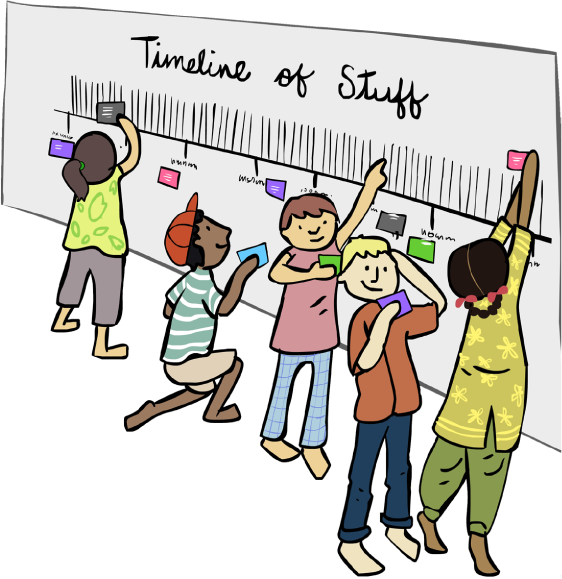 Pin or stick the timeline paper on the classroom pinboard or wall where there is enough space for students to place their fact cards. Write organic matter, paper, glass, metal and plastic on the same coloured paper that the students are using for each category. Place these above the timeline as a key. Downloading the full activity is absolutely free. Click the link, fill the form and we’ll send the download links per mail. Garbology Lite Overview Introduction To Solid Waste Waste Relay Race How Long Does Trash Last? © COPYRIGHT 2016 WASTELESS. DESIGN BY IMPPRINTZ. PROGRAMMING OFFICE4.